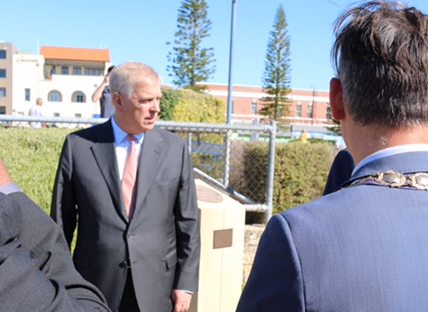 His Royal Highness The Duke of York kindly unveiled the first marker of the Fremantle Commonwealth Walkway in Western Australia today at a special ceremony in Victoria Quay, Fremantle Port. The Fremantle Port marker, mounted on a sandstone plinth, links the Fremantle and Perth Commonwealth Walkways. It also commemorates the reign of Her Majesty The Queen and The Queen’s three separate visits to the port, in 1953, 1963 and 1977. In addition, there have been a number of other Royal visits to Victoria Quay, including that of King George VI in 1927 as The Duke of York. The ceremony was expertly coordinated by the Commonwealth Walkways Western Australia Steering Committee led by Barry House and David Forster. Dr Noel Nannup, a member of the group, started the ceremony by conducting a Welcome to Country. Afterwards, The Hon Kerry Sanderson AC presented His Royal Highness with a commemorative Commonwealth Walkway WA mini marker. Further awards were also presented to Dr Brad Pettit, The Mayor of Fremantle; The Hon Barry House – Chair of Steering Committee; Mr Chris Leatt-Hayter, CEO of Fremantle Ports; and Ms Jill Hoffmann, Chair of Fremantle Ports Board. Chairman Barry House said “The marker and plaque represents the special input of the City of Fremantle/Fremantle Ports to the connection which is being made with the culture and heritage of local Aboriginal people. You will see the words ‘ngalang bidi’ meaning ‘our path’ is written on all of the markers to be used for the walkways along with Her Majesty’s EIIR cypher and this is very important to all of us, as a celebration of our shared culture, heritage and history since about 1829″. The marker will also connect with the City of Perth Commonwealth Walkway which is being progressed with the Government House marker being unveiled by the then Governor, Hon Kerry Sanderson AC in April this year. North Fremantle War Memorial – 222A Queen Victoria Street.